Charleston has some great New Year’s Day traditions--oyster roasts are extremely popular, the Polar Bear plunge on Sullivan’s Island has been going on for at least 20 years, and Charleston’s Emancipation Day Parade is one of the longest running in the nation (the first one was on January 1, 1866). But how did y’all countdown the minutes to ring in the new year? New York’s Times Square has hosted the most popular countdown with it’s famous ball-drop for over a hundred years--an estimated million revelers bear the cold to watch in person, and over a billion people worldwide watch on TV. But some cities have elected to host their own version of a countdown drop...Folly Beach, for instance, drops a giant flip flop and Hilton Head a giant golf ball. ABC posted videos of some wacky drops. and the Post and Courier compiled a pretty nice list. Some of our favorites: in Mt. Olive, NC: a giant pickle, a 600-pound Moon Pie in Mobile, AL, and a 17-foot potato in Boise, Idaho. The 10-foot guitar in Memphis seems appropriate, as does the papier-mâché drag queen in Key West. And we won’t argue with the stuffed road-kill possum in Talapoosa, GA.
As Frank Wooten pointed out in his article, why don’t we “drop” something in Charleston, starting next year--but, what would it be? He suggested, among other things, a shrimp or crab, a cobblestone, or a sweetgrass basket. Perhaps it’s only obvious to us, but what about a pineapple? 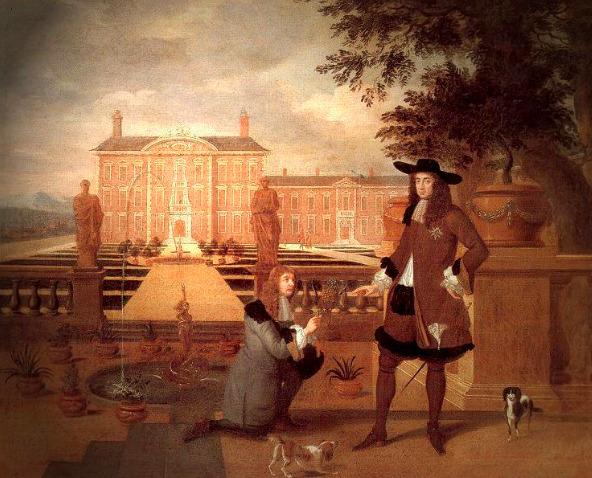 King Charles II, receiving gift of a pineapple from the Royal Gardener, John Rose. Painting, 1675, attributed to Hendrick Danckerts. It is thought that the fruit originated in South America, in Brazil and Paraguay, but the first account of the pineapple was given by Christopher Columbus, who landed on the island now known as Guadeloupe on his second voyage of discovery.Columbus brought the succulent fruit back to Europe in 1493. The pineapple was, historically, a rare and luxurious fruit. Before modern technology and fast transportation, it symbolized extravagance and wealth because fresh pineapple was so hard to come by. In the 1600s, the pineapple remained so uncommon, and such a coveted commodity, that King Charles II of England posed for an official portrait in an act then symbolic of royal privilege - receiving a pineapple as a gift. In the American colonies, the fresh pineapple was highly sought after, becoming a true symbol of prestige and social class. In fact, the pineapple, because of its rarity and expense, was such a status item that a party hostess who displayed the fruit as part of a decorative centerpiece was noted for her hospitality and affluence. Colonial confectioners sometimes rented pineapples to households by the day. Later, the same fruit was sold to other, more affluent clients who actually ate it. Lore has it that sea captains who returned from the Caribbean stuck pineapples on their gates, announcing their return and welcoming visitors. Subsequently, the pineapple became less a symbol of luxury and more a sign of hospitality, as it traditionally was in the Caribbean and West Indies. European and colonial artisans and architects began using the pineapple as a decorative motif on bedpost finials, carved into fireplace mantels, and sculpted into doorway lintels, attesting to the hospitality of the home. Now, the pineapple is a universal symbol of friendliness and hospitality. In addition to the numerous hospitality awards bestowed on Charleston, one doesn’t have to look very hard or far to spy the pineapple presence here. Perhaps the most notable example of Charleston’s historic pineapple architecture is at the Simmons-Edwards House at 14 Legare Street. Built in 1816, “The Pineapple Gates” welcome its visitors with stone pineapple-topped pillars. 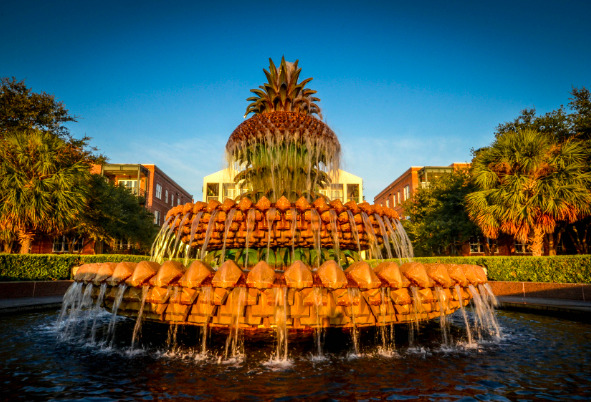 Charleston’s hospitality has been at the heart of our Waterfront Park since it opened in 1990, thanks to the bronze and stone Pineapple Fountain that welcomes waders and splashers of all ages. Charleston could actually be called the City of Pineapples...so don’t you think we should celebrate by “dropping” one next year from the top of the Francis Marion Hotel? Will you be in Marion Square for the countdown?